Call Dutch company Bresser to stop the relocation of Zeynel Bey Tomb! 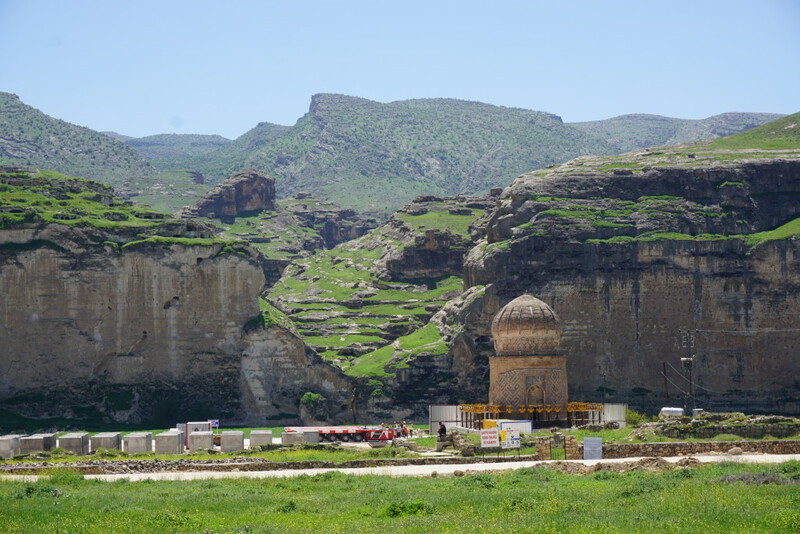 In the following days the highly controversial relocation of the Zeynel Bey Tomb in Hasankeyf could be started. This would lead to the start of the irreparable destruction of the cultural heritage of 12.000 years old town Hasankeyf and a large part of the Tigris valley in the mainly Kurdish Southeast of Turkey! Since the beginning 2016 the Turkish company ER-BU Insaat and the Dutch company Bresser Eurasia work on the relocation of Zeynel Bey Tomb, one of the most significant symbols of Hasankeyf with its globally unique cultural and natural heritage. This relocation is done in the framework of the construction of the Ilisu Dam and Hydroelectric Power Plant which is one of the most controversial dams in the world and in the last phase of its construction. In total, eight monuments are planned to be relocated before the completion of the Ilisu Project. The historical bridge pillars are in the process to be covered with stones and damaged for ever. The whole process of the planned relocation of the Zeynel Bey Tomb was violating existing laws, particularly the tender and contracting process. There is globally no similar experience with the relocation of a monument of such an age and binding agent technology (550 years old). Considering that the monument is very fragile and in poor condition (there are splits in the cupola), it is expected that the lifting of 90 cm and the continuous vibrancy will lead very likely to serious damages or even to the destruction of the tomb. But even if it would be successfull, the relocation of the monuments in Hasankeyf would lead to the loss of their cultural significance through the disconnection to their natural environment. Among others, the outstanding value of Hasankeyf is the connection of cultural heritage and nature. All our calls for the stop of the process and to discuss openly and according to international standards the whole relocation project have not been replied by Er-Bu and Bresser. The local society has never been consulted about neither the relocation of the Zeynel Bey Tomb nor the Ilisu Project. We got all our information about the relocation project from the press and through observations. Hasankeyf has been selected in March 2016 as one of the 7 most endangered cultural immovable European sites by Europa Nostra. All proposals by Europa Nostra and us for a new discussion about rethinking Hasankeyf have been not been taken into consideration. While in the beginning it was said to relocate the tomb via rails, now we found out that it will be done via an asphalt road. The companies did not inform the public about that. The asphalt machine has arrived in Hasankeyf. At the site there is nobody who gives any information when and how the relocation will be done. The relocation could be done with one day according to the project owners. The role of the Dutch company Bresser is very crucial as it is the partner which claims to be able to relocate the tomb – Er-Bu has not this capacity. Thus it is abused by the Turkish government in the sense that there are “the best international experts” doing the relocation. Bresser is going to be part of a crime against cultural heritage! Open Letter to Bresser: Failed test run – Stop relocation of Zeynel Bey Tomb!